Astronomy and the Bible, a 155-page paperback which answers 100 intriguing questions about astronomy and science by Grace College professor Dr. Donald B. DeYoung, is newly-released by BMH Books of Winona Lake, Ind., and is now available for shipping. Subtitled “Questions and Answers,” with a foreword by Dr. John C. Whitcomb, the questions range across subjects such as the earth and the moon, the solar system, the stars, galaxies and the universe, and general science. A new and helpful series of seasonal star charts for the Northern Hemisphere is included, along with a general index and a scripture index. 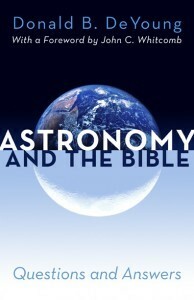 Astromony and the Bible is available for $14.99 retail at stores, online, at www.bmhbooks.com, or by calling (toll-free) 1-800-348-2756. The ISBN number is 978-0-88469-267-6.